Extra curricular activities are the scourge of my existence. They are leaving me weary and interfere with my dinner plans. I have fewer helpers and less time to prepare dinner for my increasingly hungry crowd. Food allergies prevent me from indulging in my occasional desire to pick up fast food. Food allergies also make prepackaged convenience foods cost prohibitive. So I have modified my methods to decrease the cooking time of some of our favorite dishes. Cooking the veggies over high heat in a skillet before adding them to the casserole dish reduces the cooking time of this recipe by half. Prepping in advance saves time on busy nights. Plan ahead to use leftover meat in future dishes or batch slow cook meat and freeze it in 2 cup containers. Use a food processor to grate a block of cheese all at once, instead of grating what you need each time you cook. I freeze the grated cheese in 1 and 2 cup containers, but you should review your recipes to decide what would be convenient for you. Use a food processor to chop several onions at once. I freeze the chopped onions in 1/2 and 1 cup containers. Prepare vegetables as soon as you come home from the store. After I buy broccoli, I chop up the florets and then julienne the stems to use in Broccoli Slaw or stir fry. Before celery turns, I dice the stalks and freeze them in 1/4 and 1/2 cup containers. Since most of the prep work was already done, I only had to mince the garlic and chop the carrots. This enabled me to put dinner on the table in under 30 minutes. Place oil in a large skillet. Add onions, celery, garlic, and carrots. Cook over a medium-high heat for 5 minutes. Add broccoli to skillet and continue cooking over a medium-high heat for 2 minutes. Add chicken, broth, parsley and pepper and bring to a boil. Reduce heat and simmer for 5 minutes. 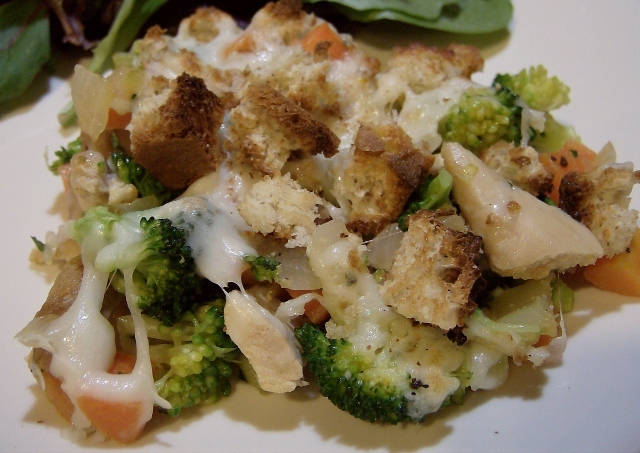 While broccoli mixture is simmering, combine bread pieces, cheese, olive oil, and garlic powder in a small bowl. Spoon broccoli mixture into a greased casserole pan. Sprinkle bread mixture over the top. Bake at 350 degrees for 10 – 15 minutes or until cheese is melted. What do you serve for dinner on busy nights? Sounds yummy! I’m curious what side dish you serve with it, if any. 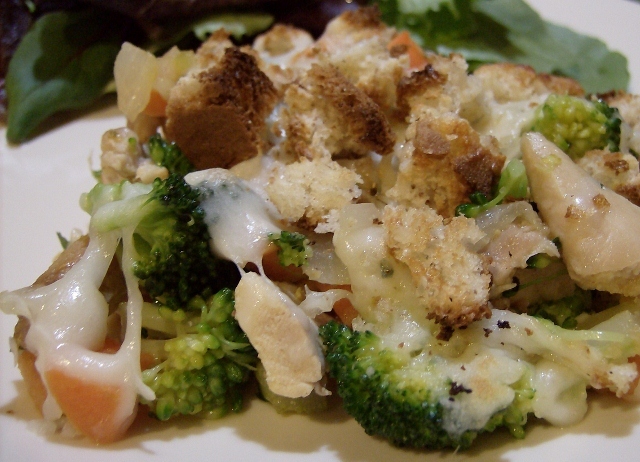 Your Chicken and Broccoli Casserole looks really good and I will definitely make it for my family. Delicious for them; easy for me. Thank you. Cindy, I am so glad that you shared a link to your recipe. It is hands down my favorite gluten free bread recipe! I try to make something in the crockpot on busy days that way I don’t have to worry so much about dinner. I definitely need to incorporate more crockpot meals into my dinner line up! Busy nights call for the crockpot! Last night I made your bacon and apple chicken…except with boneless pork chops since that’s what I had on hand. Simply delish! Thanks for the recipe, and the cookbook has many moer recipes I’m lining up to try. I was wondering if you have any ideas for recipes for someone with IBS. The main things are no red meat, low fat, no dairy. I was thinking I could modify this recipe but would love other ideas as well. You can find many more recipes by clicking on Erin’s recipe button at the top of this page. Then click on allergies, then select dairy free. It is a wonderful resource! Thank you so much Alea!!! I am trying this tonight. In an attempt to be more frugal I am replacing the bread with some crackers that need to be used up. Hopefully is still works well! Using up old crackers is a brilliant idea! I am sure it will taste great.